3 lbs. firm fleshed fish like tuna, swordfish, shark, etc. Heat the olive oil in a large kettle. Add onions, green pepper and garlic, saute until translucent. Add Italian plum tomatoes, tomato paste, wine, lemons, ½ the parsley; cook 10 minutes longer. Add the remainder of the ingredients except the fish and shellfish. Bring to a boil, then lower heat to simmer Simmer about 30-40 minutes. Add lobster tail, crab and shrimp. Do not shell any of the shellfish. Scrub clean and place in the sauce in the shell. Stir into the sauce to cover all the shellfish. Cook about 10-12 minutes longer or until the shrimp are cooked and white. Add clams and mussels. Cook about 10-12 minutes longer or until the shells of the clams and mussels are open. In 8 individual large bowls place 1 crab leg section, 1 lobster tail, 3 shrimp, 3 clams and 3 mussels. Bring the sauce back to a boil. Place the firm fleshed fish in the boiling sauce to poach it for about 10 minutes . . . no longer! Carefully remove the firm flesh fish from the sauce and divide among the 8 bowls. Ladle out at least a cup and a half of sauce over all the shellfish and firm. Make sure a couple of slices of lemon are in each bowl. Sprinkle each bowl with the remaining parsley. 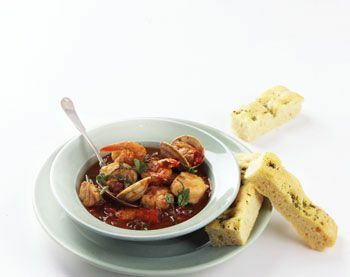 Serve with plenty of crusty Italian bread to sop up the very tasty sauce . . . And plenty of napkins! It is fairly common knowledge that Cioppino originated in the Old Italian community of San Francisco. Looking to keep the old country alive in their new surroundings, and with the abundance of fish, the new Immigrants quickly found that these new ingredients worked very well with the old Sauces, like a spicy marinara they used for Cioppino. This recipe, like the original, does not shell the fish,. It provides a great time to dig into the bowls, elbow deep in sauce, and pick out a shrimp, peel it, dip it into the sauce and pop it into your mouth. Be prepared. Serve plenty of cloth napkins so people can keep themselves a bit dry. Finally, the bread will go fast. Have plenty. This is one of the tastiest sauces around. Also have empty bowls around for all those shells!